Chicago’s Premiere Private Helicopter Tour For 4 will take you and your group to new heights above the city. In this 30 Minute Tour, you will experience the best views in town from Chicago’s only Enstrom 480B Helicopter, with windows above, below and all around! Take in the spectacular sites of the city and learn the fascinating history of Chicago’s famous landmarks as you soar along the skyline. This 30 Minute Premiere Tour will include iconic views of Willis (Sears) Tower, Millennium Park, Magnificent Mile and more! Your tour will begin and end in the beautiful dedicated tour lounge area at the Vertiport Chicago heliport, where you can relax by the full window walls and view the other helicopters taking off and landing against the backdrop of the city. Whether a resident or visitor, this is an unforgettable experience. Price is all inclusive. This private flight is for up to 4 passengers; with day or night tours available at the same price. NO additional fees. Chicago’s Premiere Private Helicopter Tour For 4 offers the best view of the city from Chicago’s only Enstrom 480B Helicopter! The Enstrom was designed for the ultimate tour experience, with windows above, below and all around, providing unobstructed views as you soar over the city on this 30 minute helicopter ride. Your Premiere experience begins the moment you arrive at Chicago’s only downtown heliport, Vertiport Chicago, located in the Illinois Medical District at 1339 South Wood Street, easily accessible and with free onsite parking. Relax in the beautiful dedicated tour lounge surrounded by glass windows, with views of the vast tarmac and activity of the helicopters as they take off and land against the iconic backdrop of the city. Your VIP experience continues as your highly experienced pilot soars towards the downtown skyline where you will take in the spectacular sights of the city. Learn the fascinating history of Chicago’s famous landmarks and historical sights as your pilot narrates your 30 minute flight. Be sure to take advantage of the Enstrom’s strategically placed windows to catch views above and below as you fly through the city. This breathtaking tour aboard the Enstrom offers amazing views of the Chicago that are not available on any other helicopter. 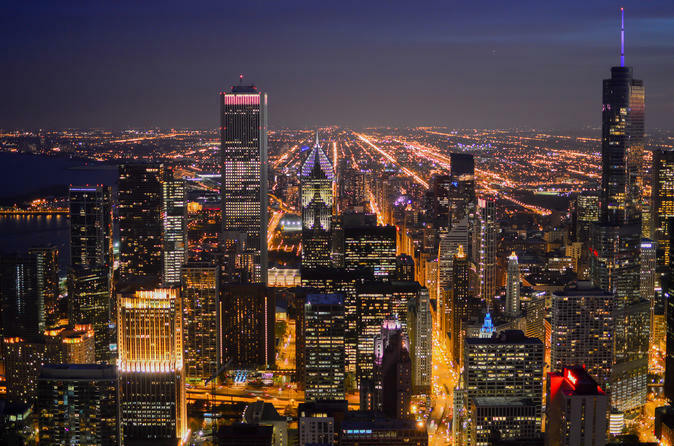 This unique vantage point from high above the city also provides you with unmatched perspective of Chicago’s most famous sights, including: Willis (Sears) Tower, the Magnificent Mile, Millennium Park, Wrigley Field, the Museum Campus, Soldier Field and more! This private flight tour accommodates up to 4 passengers in the price. It is a perfect way to share a unique VIP Chicago experience with your family, friends or colleagues. Celebrate a birthday, go on a double date or treat clients to a one-of-a-kind outing! The possibilities are endless. Book your Chicago Premiere Private Helicopter Tour For 4 today! Day or night tour options are available at the same price.